When one thinks of the holocaust one would say Hilter is responsible for the killing of millions of Jews. This of course is true but he had people by his side helping him out, which made those people just as horrible. One of these infamous people would be Rudolf Hess. 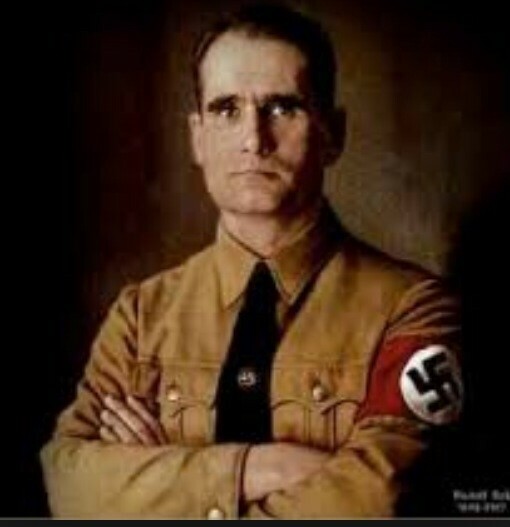 Rudolf was Hitlers wing men, he believed that everything Hitler did was right he thought Hilter was "amazing". He was the deputy of the Nazi party making him in charge of a lot of their actions towards the Jewish population. He had the task of realizing the "ideogical" program. One of the demands for this program was the destruction of racial stock, which in this case was the Jewish people. Rudolf did many crazy actions like this making him a criminal. After being convicted Hess was sentenced to life in prison, but in 1987 at the age 93 Hess decided to end his life by committing suicide. No one is for certain of why he did this, but he did suffer from apathy, amnesia, and was diagnosed as having a "hysterical" personality. To conclude, Hess was a great help to Hitler. Being deputy of the Nazi party and making very un-human like decisions on how to treat the Jewish population made him a criminal. It's hard to say how I feel about Hess's punishment. Do I think he deserved what he got? Yes very much so, but I feel that he deserved more then just being sentenced to life in prison. Personally I feel like they should have hung him on the spot of something of that kind. The issue with that though would be fighting fire with fire, and that was the last thing that the U.S. should do. So of course I agree with him being sentenced to life in prison, but I wished they could have done what he did to all of the Jewish people.